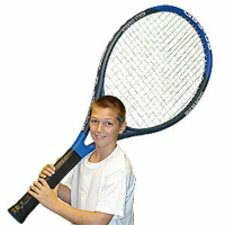 We have many tennis related items for your tennis club, junior program, fund raiser, tournament or allied tennis needs. When you are in the right frame of mind give us a call at 800 960-9080 or 206 285-5359 (Seattle) or email us at donace@promotionalproductsandideas.com or don_shepherdson8@msn.com and we can discuss items and ideas that will let you accomplish your goals and achieve maximum net results. 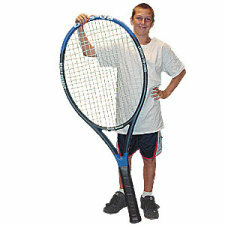 The Tennis Racquet String Dampener measures 1" X 1" and stops the vibration in the racquet. 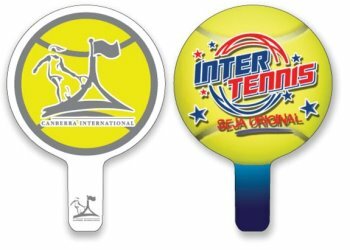 It can be custom imprinted for your club, tournament, school, tennis academy, corporate events, tennis business or organization. Less than $ 3.75 each in the minimum of 250. 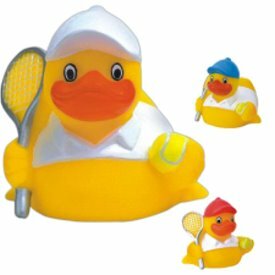 Our tennis 3 1/2" X 3 1/4" X 3 1/4" rubber ducks are a certainty to create quite a racket wherever they are received. Available in your choice of Red, Blue or White hat. Imprint area is 1 1/8" X 1/2". Less than $ 2.90 each in the minimum imprintable quantity of 50. 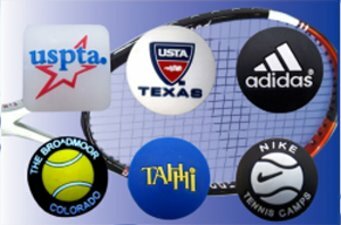 Great product for schools, tennis organizations and tennis booster groups. Sponsors can display their message on the front of the fan and a schedule on the back, The fan is 8" in diameter and is weather resistant to rainy days. Less than $ 1.25 each in the minimum imprintable quantity of 100. 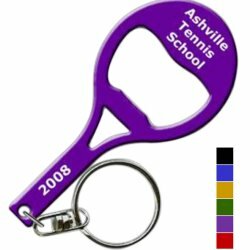 The 3 1/4" X 1 1/2" X 1/8" Tennis Racquet Bottle Opener is available in assorted colors of Black, Blue, Green, Gold, Purple and Red. It provides an imprint area of 3/4" X 3/16" or 5/8" X 5/*". In the minimum of 50 with a one color imprint the price is less than $ 1.50 each. 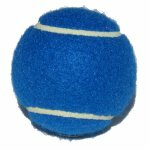 The 2 1/2" diameter Tennis ball yo yo is also a stress reliever, It provides an imprint area of 1 1/4" X 3/4" and is less than $ 2.00 each in the minimum imprintable quantity of 100. 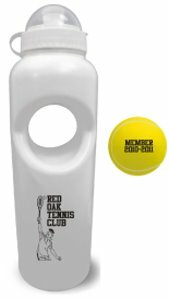 The 5 5/8" X 2 9/16" X .125" high impact styrene white plastic key tag is an absolute must for every tennis bag. The tennis tag provides an ample imprint area of 4 3/4" X 2 3/$". Less than $ 3.00 each in the minimum imprintable quantity of 150. This 30 oz. - 10" X 3" Water bottle has a built in tennis ball stress reliever. It provides an imprint area of 1 3/4" X 2 3/4" on the water bottle. Less than $ 4 each in the minimum imprintable quantity of 50. These large inflatable tennis balls are Bright Yellow with white markings. The 6" size provides an imprint area of 3 1/4" wide X 1 1/4" high and the 16" size has an imprint area of 6 1/4" wide X 3" high. These are great attention stoppers and have a minimum imprintable quantity of only 50.The 6" size is less than $ 3 each in the 50 quantity and the 16" size is less than 3.00 each in the 50 quantity. The giant tennis racquets are just right for that big game. They are 55 inches tall and have a 23 inch wide head. Minimum order is just one. Call us at 800 960-9080 for current pricing. The Smart Park is an easy way to always park your car in the garage in the same position every time. You can hang your Smart Park from the overhead area of your garage and this will enable you to always align your motor vehicle up with the hanging tennis ball which will gently touch your windshield when you have properly positioned your motor vehicle in the garage. 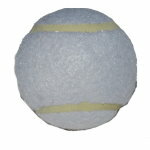 The imprint on the tennis ball is 1 3/4" X 3/4" and the product is a great fund raiser. Minimum order is 100 and they are less than $ 5.60 each in that quantity. 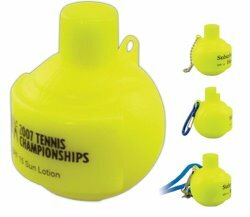 These delightful tennis shaped canisters contain 1/4 oz. of mints. Choose from Cinnamon, Wintergreen or Peppermint mints. The tin is recycleable and it measures 1 3/8" X 3/8" and provides an imprintable area on the tin of 1 1/8" in diameter. Less than $ 1.85 each in the minimum imprintable quantity of 250. These are great promotional items for beach and outdoor play. Kids love the item and adults love to take a swing too. The imprintable area on the ball is 2" wide X 1" high and the racquet provides an imprint area of 4" wide X 3" high. Less than $ 5 each in the minimum imprintable quantity is 50. Sold as a set only. 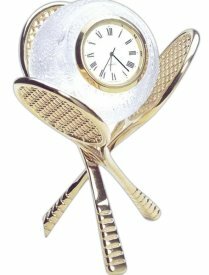 The 4" X 4" X 4 1/2" Tennis Ball award clock is made of 24% crystal with Roman numerals and second hand on a gold plated brass tennis racquet stand. Less than $ 28 each in the minimum oimprintable quantity of 50. 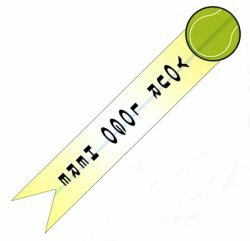 The 4 1/4" X 1 3/4" Tennis Racquet pen with light has an imprint area of 5/8" X 1" on the plastic oval disc. The minimimu imprintable quantity is 600 and they are less than $ 1.60 each. Our premium twill tennis visor features a twill crown with matching twill binding, matching twill self adjusting back strap, twill sweat, buckram lined, easy green undervisor and a Poly Pro visor board with memory shape. One side fits all. Available in colors of red, black, white, royal and navy twill. Visor can also be embroidered on the back strap as pictured below. Minimum quantity with an imprint is 72.Call 800 960-9080 for current pricing. Here is a great tennis hat that really protects you from the sun while still letting you enjoy your tennis game or other outdoor activities. This white cotton tennis hat comes in white only and looks really stylish with your resort or tennis club name on the brim. Many tour groups use hats like these to identify who is on the tour group. We have many other clothing items available but this is truly one of our top values. Minimum with an imprint is only 72 hats.Call 800 960-9080 for current pricing. 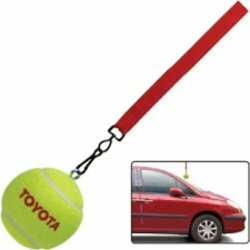 Our 1 1/4" mini tennis ball key chain is always a crowd pleaser for young and old alike. Here are just a few slogans that might wish to put on the imprintabel area along with your message. Here is our two tone twill tennis cap with a natural crown. It has an ample 3 3/4" front height, contrasting color bill, button & eylets and a plastic snap back. Available two- tone color combinations are dark green bill/natural crown, cardinal bill/natural, royal bill/natural, black bill/natural, navy bill/natural and red bill/natural.Call 800 960-9080 for current pricing. We have several types of headbands available however our most popular one is that of our Terry with built in hook and loop closure. The standard length is 27" in length by 1 1/8" width. Available in various colors these headbands are really great to make your tennis game or other sport a "no sweat" day. Less than $ 6.00 each in the ,minimum imprintable quantity is 50. 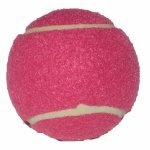 Our custom imprinted tennis balls are especially appreciated as corporate gifts for company tennis tournaments or for that all important customer that enjoys tennis. 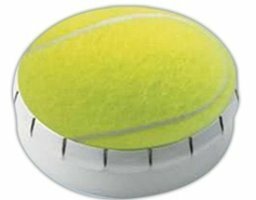 The imprintable area on each indicidual tennis ball is 1 1/4" X 3/8. In the minimum of 100 balls with a one color custom they are less than $ 1.85 each for the Blue, Green, Orange. Purple, Red and Yellow tennis balls. Please note that White Balls are not available. Here is a tennis bag that measures 9" X 9" X 22" with an imprint area of 6 1/2" X 6". Available in Black, Navy, Black/Forest with Black/Forest trim and Navy/Charcoal with Navy/Charcoal trim. It has a large main compartment with U-shaped entry, a gussetted full-width front and two end pockets and a detachable shoulder strap with a rubber shoulder pad. The fabric is 600 denier polyester. Minimum imprintable quantity is only 25.We have tennis bags that can hold up to 9 racquets. Please call 800 960-9080 to discuss the type of bag and quantity of racquets that your bag needs to hold. 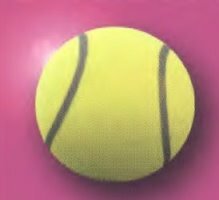 The tennis ball is in 3D and it looks just like a window that has been broken by an errant tennis ball. 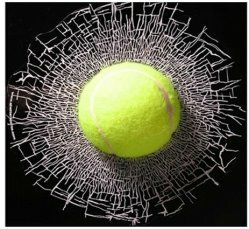 Actually it is a static cling of an actual 1/2 of a tennis ball. Great product for fundraisers and booster clubs. The break thru decals adhere to any smooth surface using its static cling - no adhesive or messy residue. Custom imprintable area is 1" X 1" and in the minimum of 250 they are less than $ 12.00 each. This 12 oz. tennis mug has a minature tennis ball that spins at your touch on the handle of the mug and is a BPA ceramic mug.. It is a great conversation piece and the net result is that your customers or the recipient of this item if it is used as an award will consider it to be "their mug of choice". Minimum imprintable quantity is 144 and they are less than $ 6.00 each in the 144 quantity. Tennis Towels are very popular for corporate tennis tournaments and of course all type of tennis events at tennis clubs. Minimum imprintable quantity can range from 25 to 100 depending upon the selected towel. 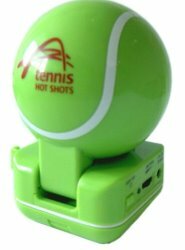 Call 800 960-9080 for sizing and current pricing information..
Made from plastic the tennis ball shaped USB speaker can be custom imprinted and is less than $ 12.50 each in the minimum imprintable quantity of 50. 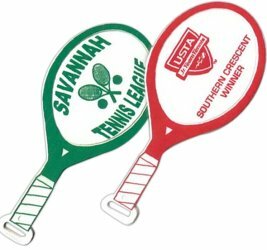 The 6" long X 1 1/2" wide Tennis bookmark provides an ample imprint area for a school team schedule or it can be used as a fund raiser. Less than a dollar each in the minimum of 250. 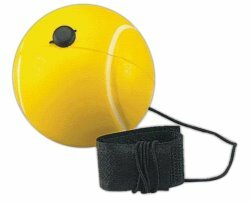 The Tennis Pen sits in it's tennis ball stand and is a real eye catcher. The imprintable area is 1 1/2" X 1/4" and in the minimum imprintable quanity of 50 is less than $ 11.00 each. 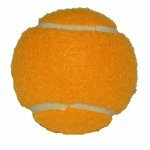 Ace your events with our tennis ball shaped 1 oz. sunscreen bottle. It comes with a tag that is attached with the product information. The imprint area is 1.45" X .65" and the product is less than $ 3.50 each in the minimum imprintable quantity of 150. The 2 5/16" X 1 5/16" X 1 5/16" Tennis shaped whistle has an imprintable area of 9/16" X 1 1/16" oval disc that is attached to the whistle. Less than $ 1.35 each in the minimum imprintable quantity of 150. Great product giveaway for a tennis coaches clinic. 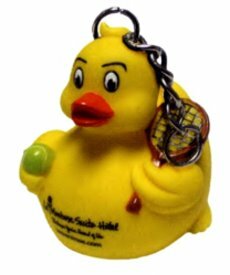 The tennis rubber duck keytag measures 1 1/4" X 1 1/2" X 1 1/2" and it provides an imprintable area of 5/8" X 5/16". Less than $ 1.60 each in the minimum imprintable quantity of 50. 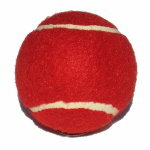 The Tennis Ball ornament is made of soft foam and it provides an imprint area of 1" X 1". Less than $ 1.55 each in the minimum imprintable quantity of 50.